We’d love you to come and try the classes for yourself. 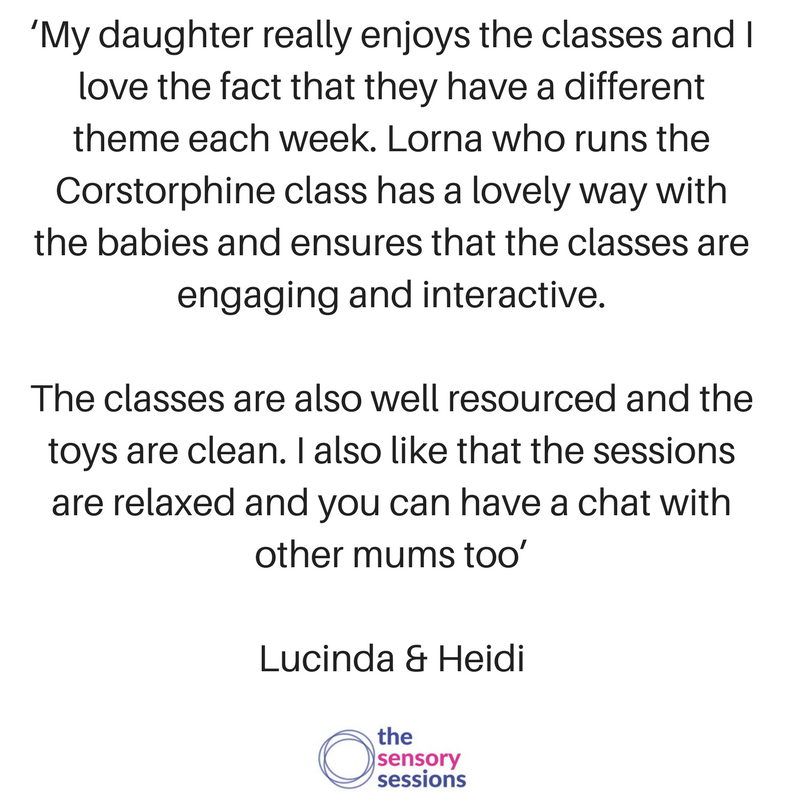 Here is what some of our mums and dads have said about our classes (and thank you for letting us show some of your lovely photos). We started baby massage and sensory class when Leonardo was 6 weeks old slept for the first few weeks through the whole class and now at almost 11 months can’t get him to stop and almost walking! 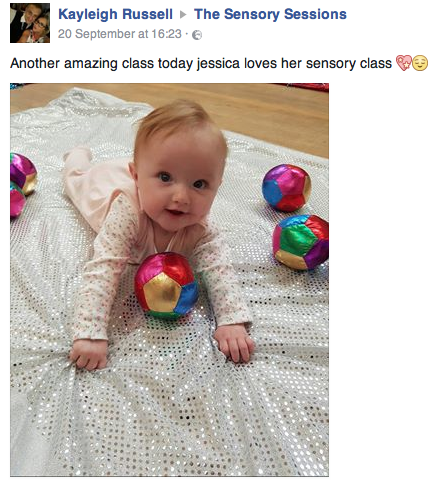 Was a great class to start my week off and keep me sane speaking to other mums to get ideas to make your baby sleep! We loved all the themed weeks and the classes were great and brought him on so much. Met some great people along the way and was nice to see other babies grow into little people. Lorna, Katy and Louise you were great we will miss you all however hope to see you at messy play sessions. 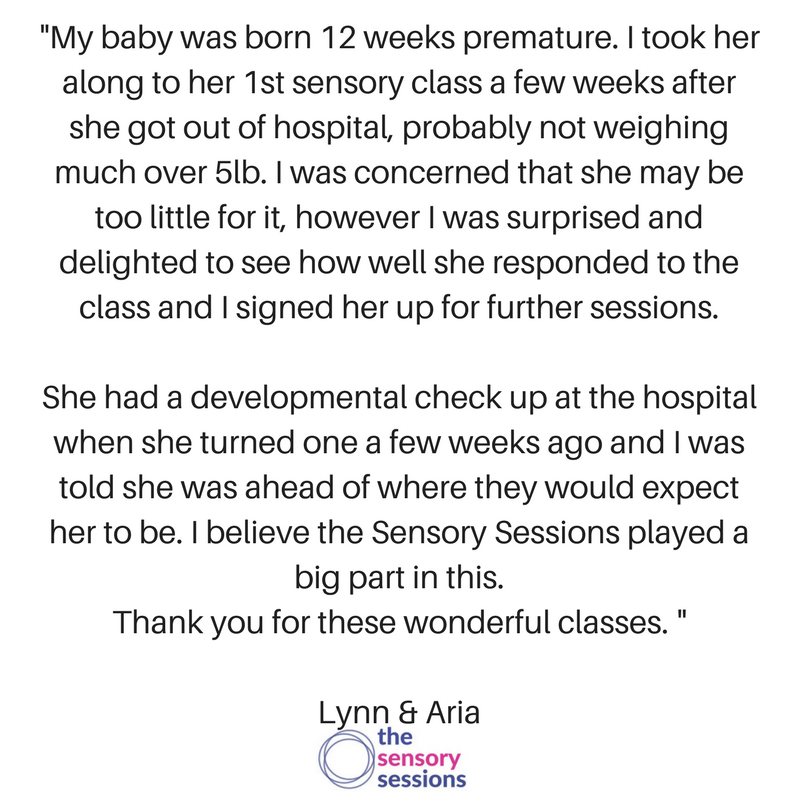 I just wanted to say a huge thank you to everyone at sensory sessions from Isabella and I. Today was our last class and we have loved every class. It was fab meeting lots of mums and their babies and we have had lots of fun with the different themes each week. I can’t believe yesterday was our last session at The Restoration Yard, how has my maternity leave went so quickly! Work is calling…..
Lots of love to Rebekka who has been an excellent facilitator of our class. 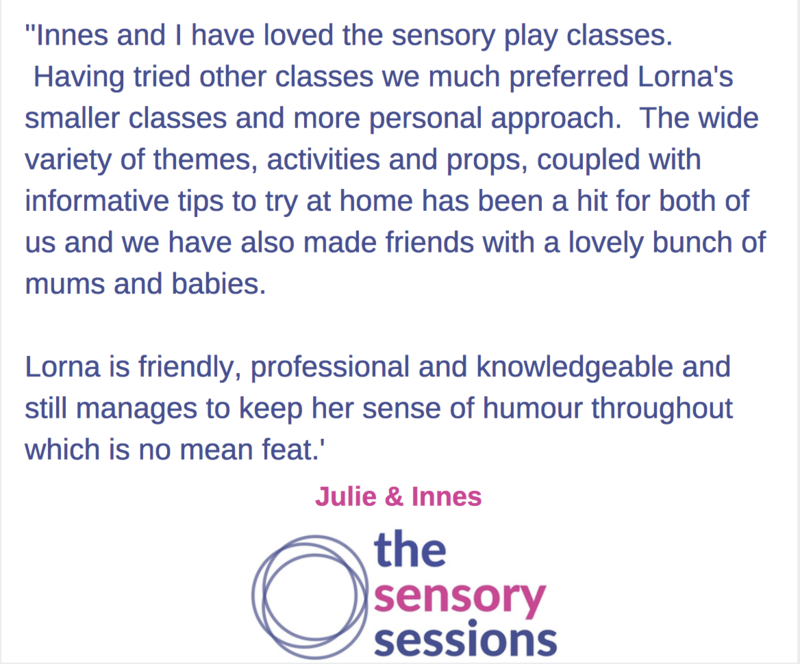 Rory has loved his sessions and our classes have given us lots of ideas for fun at home. It’s been amazing watching him develop and it’s such a great way for us to meet other mums with children the same age, turns out nobody gets any sleep! 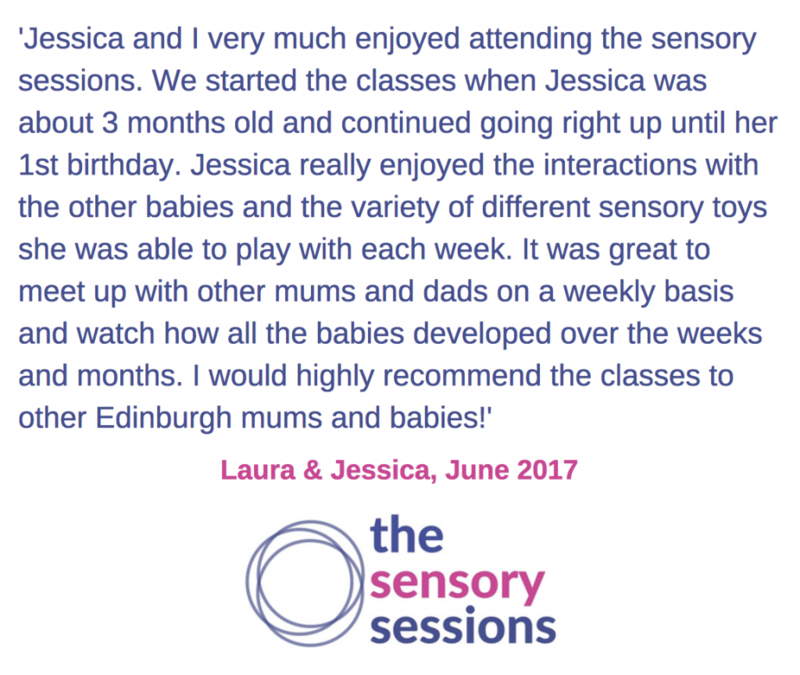 I took my baby to a free trial session when he was 8 weeks, it was a great way to find out what it was like before committing to a term. Owain really enjoyed it and I feel like he got so much out of it with the group activity, important tummy time and then free time to explore the different stations. It was lovely to have a different theme each week. One of Owain’s favourites was under the sea, especially the group activity at the end where the babies lay down under a piece of fabric, homemade with fish, seaweed etc dangling down! Katy was also very informative; explaining each part and how it can aid their development. 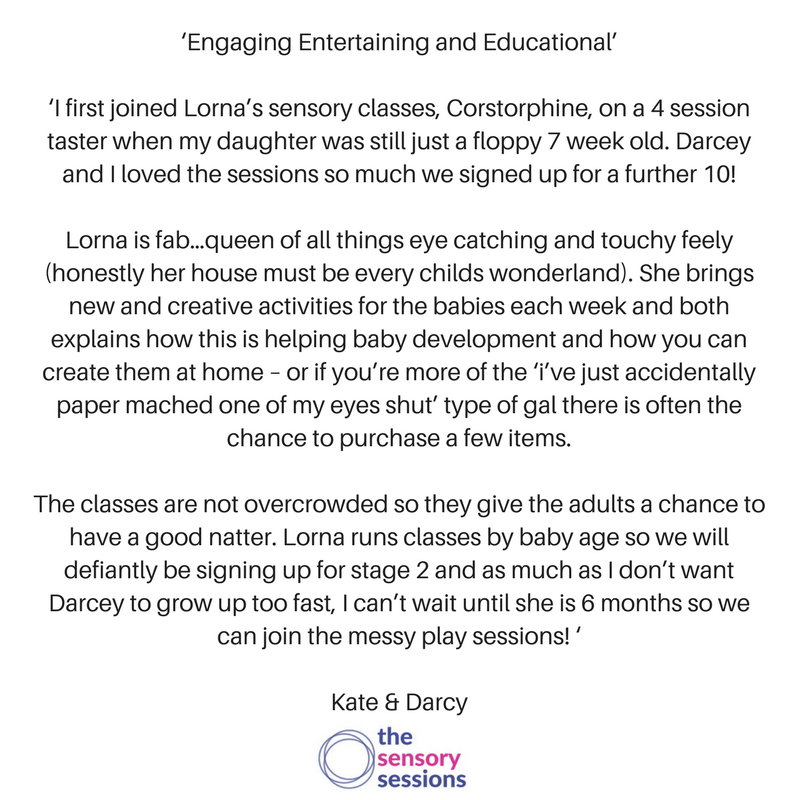 I would definitely recommend this class to any new Mum and baby. Sensory sessions have been really enjoyable! Katy is fantastic and I have learned a lot regarding how to play and stimulate my daughter. Also the socializing part has been really good. I like the relaxed environment and the various themes. 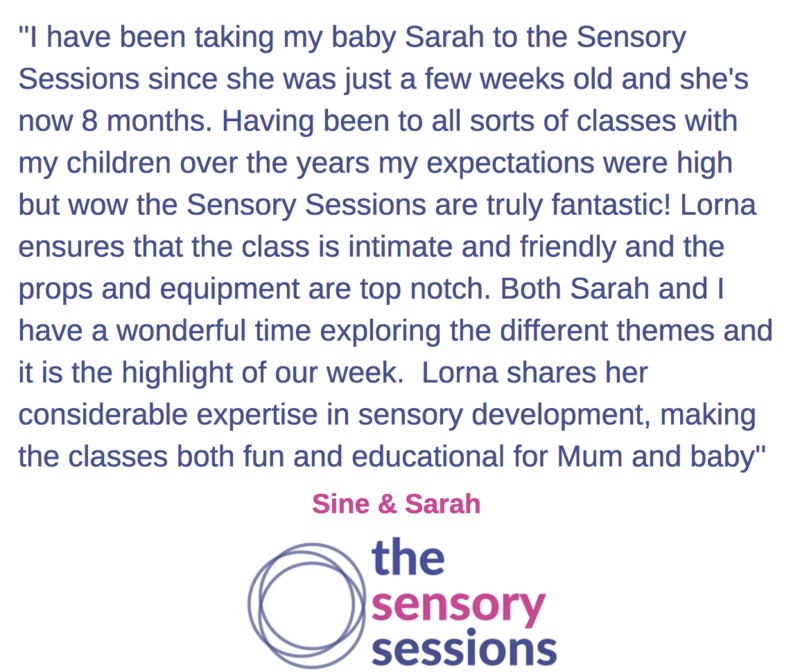 We had our last sensory class on Wednesday as I am due to return to work soon. I would like to say that we thoroughly enjoyed our class, this was also due to Rebekka. She is a lovely woman and makes an excellent leader – what a credit to the company she is, my son loved her. The photo above shows Blake loving his first ever sensory class at 3 1/2 months old with his daddy. He loved the black, white and red theme. Seeing Blake’s reaction in class to all the sensory stimulation was incredible, we even bought a foil blanket to recreate sensory play time at home. He loved playing with the texture ball, it helped Blake with tummy time and learning to sit at 4 months old.